For over 35 years we’ve used proven chiropractic techniques to relieve mild to severe back and neck pain. We consistently help those injured at work or in accidents live a better, pain free life! At Citrin Chiropractic we maintain memberships and affiliations with the top local and national chiropractic associations. We also have dozens of five star reviews across Google, Facebook, Yelp, and Demand Force. We encourage you to read our reviews, watch video testimonials from our past patients, and then call us for a free diagnosis if you are looking for a St. Louis Chiropractor! Both doctors are currently members of Missouri’s most trusted source for chiropractic care information. Citrin Chiropractic is affiliated with the American Chiropractic Association (ACA) which has provided care for the US Military. Dr. Citrin & Dr. Rutherford both graduated from Logan College of Chiropractic, one of the premier programs in the country. 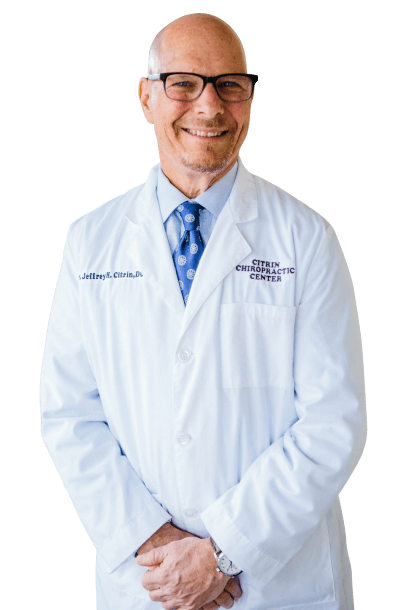 Meet Dr. Jeffrey Citrin, D.C.
Dr. Jeffrey Citrin, a top rated St. Louis Chiropractor, founded Citrin Chiropractic Center in 1977. He is a current member of the Missouri State Chiropractic Association (MSCA) and he’s been dedicated to providing St. Louisans with reliable chiropractic care for over 35 years! 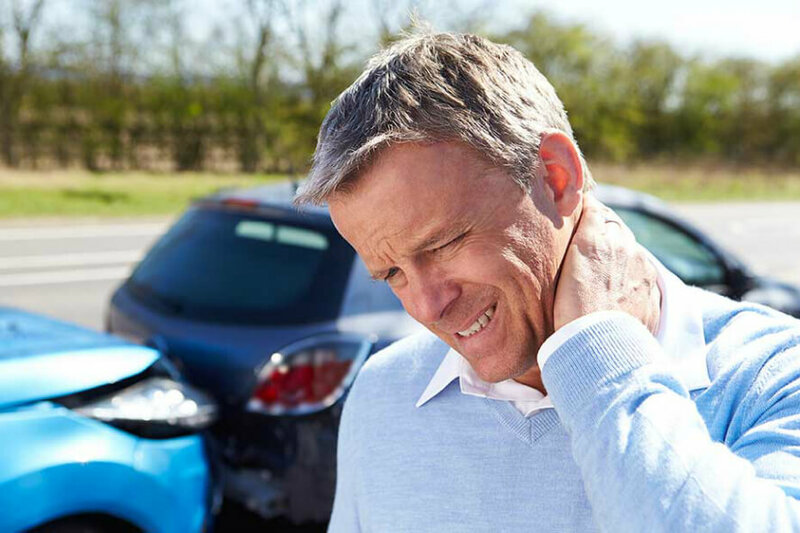 Dr. Citrin has undergone special training in treating Auto Accident Victims, Musculoskeletal Injuries, as well as Headache and Pain Management. He’s received numerous awards for his excellent chiropractic care including the prestigious “Chiropractor Of The Year” award from the St. Louis Chiropractic Society. “Doc C” has not only helped thousands of individuals suffering from back and neck pain in St. Louis but he’s also provided the U.S. Military with chiropractic care! Many doctors “hide” behind their staff, making it hard to speak to the actual Doctor, but that’s not Doctor C. You can reach him via his personal cell and email as one of his patients! 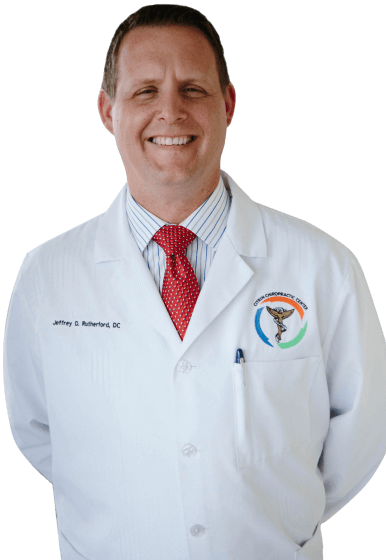 Meet Dr. Jeffrey Rutherford, D.C.
Dr. Jeffrey Rutherford has 18 years of experience providing chiropractic care in St. Louis, MO. He joined Citrin Chiropractic Center in 2003 and had previously operated his own practice just miles away from the current facility. Dr. Rutherford is currently a member of the Missouri State Chiropractic Association. Fun Fact: Dr. Rutherford was actually drafted by a professional baseball team! He’s very active, loves the Cards, and enjoys helping his patients enjoy an active lifestyle. He’s seen first hand how injuries and pain can hamper not just athletes, but everyone. Doctor R. is passionate about helping these individuals get their lives back! Dr. Rutherford does everything in his power to see patients on their schedule. He realizes everyone is busy, so he does a great job of making himself available. If the answer is yes, the best thing you can do is talk to a chiropractor before the pain gets worse. We’ve helped thousands of patients over the past 35+ years. Below, you will find just a few of our success stories. Watch the client testimonials below and listen to how they describe the treatment we’ve provided them. 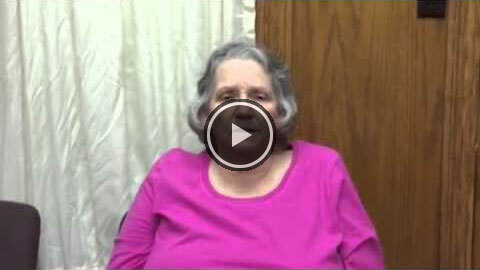 Nothing excites us more than hearing about the pain relief our patients experience! We help eliminate back pain with non-surgical chiropractic care. Whether it’s lower back pain or upper back pain, severe or mild, we can help! Experiencing daily, throbbing pain or pulsing? Let us determine if chiroporactic care can help alleviate this pain. Neck pain is one of the most common conditions we treat and it can be caused by poor sleeping positions, accidents, and more. Millions suffer from sciatic pain and our doctors offer affordable chiropractic care to eliminate this type of pain. Car accidents can cause serious sprains, strains, and soft tissue injuries and it’s recommended you see a chiropractor following an accident. Sports injuries, work accidents, strains, and more… we treat them all. Give us a call so we can help you get back to 100%! Of course it goes without saying that lower back pain is the major reason why anyone would go see a chiropractor in St. Louis; it must be noted however that ‘lower back pain’ is far too generic a term when it comes to the many causes for lower back pain and the determination of the types of treatments to control or eliminate it altogether. Your back is one of the most complex parts of your body. An area where nerves, discs, tendons, and bones all come together. Chiropractic care is often the best and most recommended form of treatment if you are suffering from lower OR upper back pain. We’d be more than happy to sit down with you to determine what could be causing your pain and then provide you with a recommended treatment plan. Click the button below to get back pain relief today! Migraine headaches typically involve intense throbbing and what is often described as a pulsing sensation on one side of the head. Many times a person with a migraine also experiences vomiting, nausea and they become extremely sensitive to sound and light. Migraines can last for several hours to several days and can be quite incapacitating. They are sometimes preceded by what are known as aura (sensory warning symptoms) such as light flashes, blind spots in your vision or a tingling sensation in your arms or legs. Certain medications can reduce the severity and the frequency of migraine headaches. And when combined with consistent chiropractic care we’ve seen our St. Louis patients eliminate their migraines all together! Click the button below if you are experiencing pain from migraines and headaches because we can help you! Most simple ailments of your neck result from poor posture, overuse or everyday wear and tear. More severe neck problems are often the result of such things as contact sports, whiplash from car or work accidents, or severe falls. Severe neck problems are the ones that are more likely to need medical attention if the pain does not subside in a few days. It is advisable to seek medical treatment immediately if the pain in your neck is excruciating or accompanied by other symptoms such as weakness in your arms and legs or dizziness. We’ve treated thousands of St. Louis patients over the past 35 years experiencing mild to extreme neck pain. We’d love to schedule a time for you and one of our St. Louis chiropractors to sit down and talk for 30 – 45 minutes to get to the bottom of the issue. Medication will often times help, but consistent chiropractic care will do more than just “put a bandaid” on the pain. The symptoms of sciatica usually occur because the large sciatic nerve gets compressed or irritated in what is known as the lumbar spine. The sciatic nerve is the largest nerve that is found in the human body. 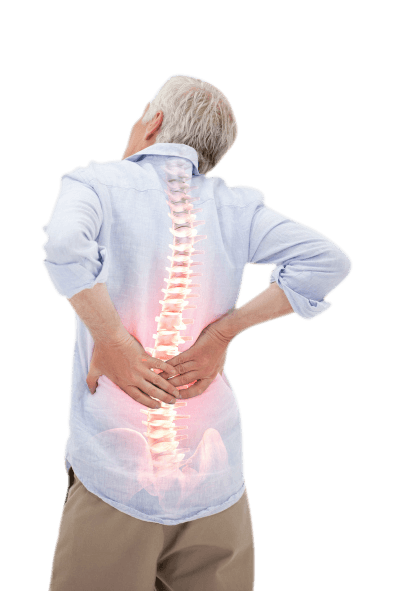 The pain from sciatica can vary greatly from person to person. For one person the affliction might just be infrequent and annoying while for another person the constant sharp pain can be incapacitating. Permanent nerve damage is rarely associated with sciatica pain. 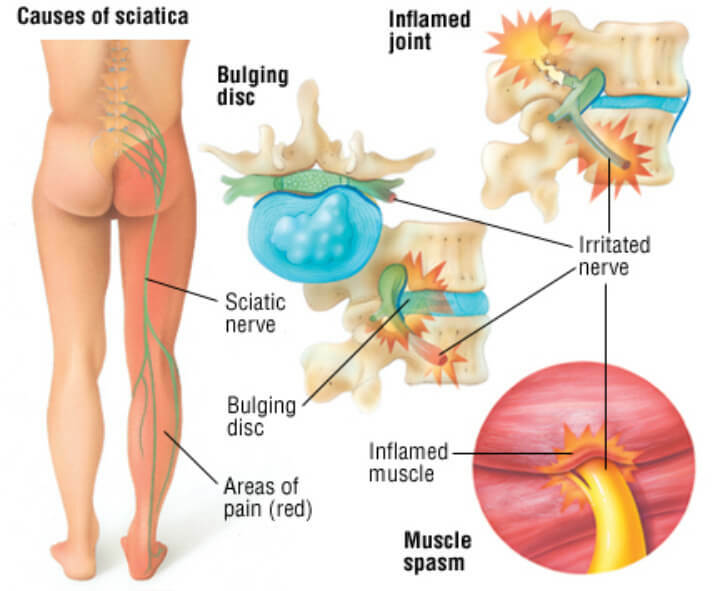 The sciatica pain symptoms that each individual person experiences are often determined by where the sciatic nerve is pinched. Over the past 35+ years we’ve gained experience as St. Louis Chiropractors and learned how to target treatments based on the pain symptoms. If you are injured in an automobile accident it is something you need to take very seriously and monitor closely if you are not already receiving medical attention for your injuries. Even if you don’t feel like you have been hurt you need to be aware that sometimes injuries received in crashes take a few days to show up because of the nature of them. One of those injuries is whiplash; it is not uncommon for a whiplash injury to not show up until several days or weeks after the accident happened. So never assume automatically you have not been injured in a car accident just because you don’t have pain or other signs of an injury right away. One of our core specialties is treating victims of car accidents. We’ve worked with dozens of local personal injury attorneys and doctors to get to determine the severity of the injuries. If you have even the slightest concern about pain from an accident, call us today to schedule a free consultation. There are a lot of different terms used to describe disc injuries in the back. The terms “pinched nerve”, “herniated disc” and “bulging disc” are all used to describe this type of pain. It seems that even experts in the healthcare field have trouble deciding exactly what each of these terms mean and how to best describe them. When you add the many different terms for disc problems in the back (torn disc, ruptured disc, slipped disc, disc disease, collapsed disc, disc protrusion) it only makes things more complicated. Instead of worrying about exact definitions or terms it is best to describe a disc injury’s nature with an accurate medical diagnosis. If you feel you might be suffering from a disc injury, go ahead and call us. You can speak directly with one of our two top rated St. Louis chiropractors right away. We’ll then setup a time to meet with you and determine the next best course of action. Dr. Citrin and his staff was quick to see me after my accident. 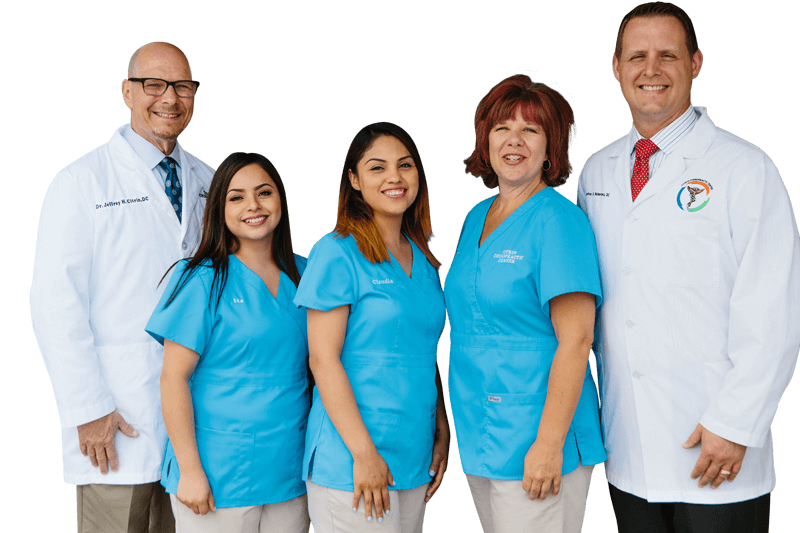 Once in the office they were very concerned about starting the correct treatment for my injuries asap…He and his staff are very professional and courteous! I recently went to see Dr. Citrin with a lingering severe headache and tension. I found immediate relief after the visit, and within a day almost full relief. Later that night I realized that the shoulder pain my general practitioner had diagnosed as arthritis was also gone! Dr. Citrin was able to help my wife throughout her entire pregnancy, as well as after our baby was born. We are thankful we found him and recommend him to all our friends! I had a slight lower back pain that bugged me for over a week, I was able to get an appointment with Dr Rutherford at Citrin Chiropractic Center on the same day. They accepted my insurance and now I am pain free. It was the first time I have ever had any back pain and I hope it is the last. I truly love the people who work here! They are friendly, and efficient and make you feel like family. 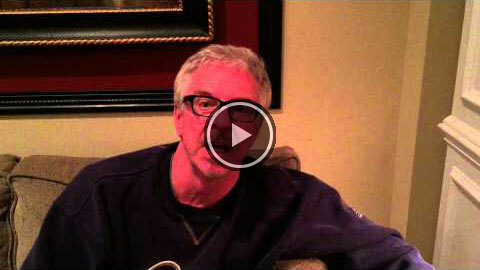 Dr. Jeff Rutherford is very professional and is very clear in explaining the treatment to you. He has a great bed side manner and is very compassionate toward his patients. Claudia and Ita are very friendly and always make sure that the patients are comfortable and have every thing they need. Brittney the massage therapist is friendly and although I have never had a massage I think she is very good at her job. She always makes sure that you are comfortable. 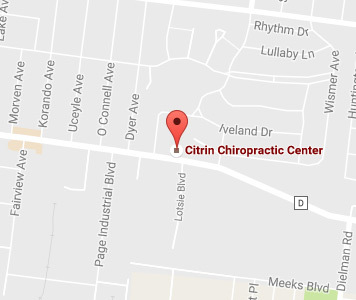 I would definitely refer friends and family to Citrin Chiropractic Center. Book Your Free Chiropractic Consultation Below! Free Pain Diagnostics - Call Now!